We've gone to Alsace to spend All Saints' Day with family. So, of course, I had to bring some knitting. But my merlot-colored sweater was in a delicate spot and my lace scarf is not easy to transport because the yarn is in hank-form, not ball-form. Naturally, I had to start a new project. 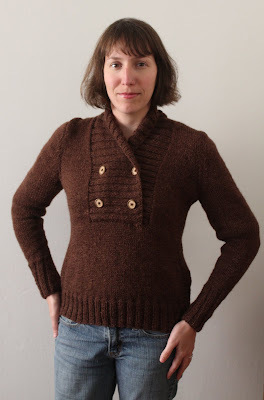 I chose the Girl Friday sweater from Knitty, a pretty shawl-collar design with a big lace pattern. Just in time too, because we already had some snow here! OK, OK, it melted right away, but still. I'm using the grey merino wool from Rowan - the same yarn that I used for my failed project this summer. So far, so good ... knock on wood. Happy Halloween to everyone who celebrates it!! Oh, my! How precious is that?! I need to learn how to knit!! What a gorgeous design! Looks amazing against that carved table :) they match in a way! I love the design you chose. It´s going to look cute on you! It's going to be so lovely in that color!! Ooh, this is going to be gorgeous! I'm so excited to see this! It looks gorgeous.I am intrigued to see how it turns out. And snow already? Eeek.